When you’re looking for professional painters in Kansas City to refresh your house or business, you want to be sure that you made the best possible choice. You want to know that you’ve selected a company you can trust to get the job done professionally and on-time. You want experienced painters to handle your home painting or commercial painting, and high-quality services you expect. The process is easy: you ask for a free online quote and we will assign a team of passionate painters to work on your home. Our Kansas City painting company’s crew is reliable and time-oriented, so no matter where you live, you can rest assured that our team will turn up on time, every single time. We are painting gurus, thanks to decades of extensive experience, so we are capable of answering any questions you might have, giving you full confidence in our painting company. Let Sharper Impressions give your KC home or business a beautiful new feel you’ll love for years to come. We are conveniently located in Shawnee, Kansas, just steps from beautiful downtown Kansas City. Located in the heart of the US, Kansas City is a city that is overflowing with spirit, culture, history and fountains. Just walking down the streets, you’ll find an abundance of public art and delicious barbecue, as well as friendly neighborhoods outside the city. KC, the City of Fountains, truly does an amazing job at continuing to grow, while staying true to its roots. With so much to explore in KC, most residents don’t want to waste their free time catching up on chores like house painting. That’s why we’ll take care of it for you. Since 1992, Sharper Impressions Painting has livened up residences for homeowners across the city and the surrounding suburbs. Our unrivalled house painting services extend to many nearby areas. We operate a no-deposit policy, meaning that you won’t have to pay until the work is done—in style! Looking for a house painting company in Kansas City to give your home a fresh look? Call Sharper Impressions Painting today to schedule a free estimate, or request a free quote by filling out the form below! What makes Sharper Impressions your best option for professional painters in Kansas City, Kansas? Our 25 years of service has given us valuable knowledge and industry experience, earning our painting company several awards and countless customer referrals. 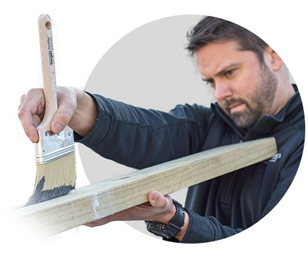 We are determined to bring new life into your home or business, always giving you the friendly, professional service you expect in a painting company. to give your home a fresh look?